I had a fine time on April 5 at Domaine Wine Bar in Long Island City. Excellent small plates, friendly solicitous service from Candace behind the bar, the Vernon-Jackson subway stop right in front. Domaine is an atmospheric wine bar and thus dark. The lighting scheme is red (which you’ll have to imagine) with disco-ball lighting. But the music is stellar and I was dangerously close to the two sliders, so you’ll hear everything. Walter is to the left of the piano; Todd is to its right. Matt is playing it. Here is the first part of the evening. I look forward to future appearances by this trio: a very generous outpouring of creative melodic improvised music. Memorable music blossoms forth without fanfare when the right creative spirits come together. And such music isn’t always created by Stars — people who win polls, who record CDs for major labels. Two examples from a Saturday brunch gig in New York City follow. The very perceptive Rob Adkins, string bassist extraordinaire, arranged this session on August 1, 2015 — Matt Musselman on trombone, Kris Kaiser on guitar. And they made lovely music. 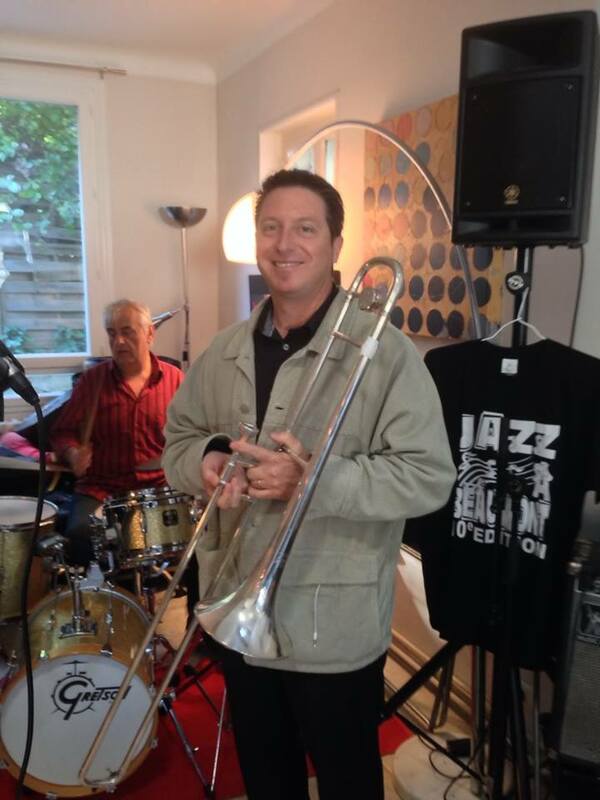 But then someone came in — new to me but very talented: trombonist / jazz whistler Ryan Snow. There’s a small tradition of two-trombone teams: Cutshall and McGarity, Johnson and Winding, Vic and Eddie Hubble are the first teams that come to mind. And two trombones lend themselves to trading off: you play eight bars, I’ll play the next, and so on. Marvels take place amidst the hamburgers and Cobb salads, the gallons of beer and Diet Coke . . . Since I’d never heard of Ryan, I asked for a brief biography. You should know that his August 2015 visit to New York was prelude to his attending law school at the UVA School of Law in Charlottesville. He will do great things . . . but I hope he visits New York again to play and whistle, to lift our spirits. Born and raised in Stanford, CA, child of two professors and avid music lovers, grew up surrounded by music in the home and going to see live music of all kinds. Started playing piano privately at 9 (hated it), trombone at 10 (loved it) playing in the school band. Parents gave me Blue Train, Kind of Blue, and a J.J. Johnson on Columbia album for my 12th birthday and I began listening to jazz obsessively, buying CDs and spinning them till I knew every note, then going to get more. That and being lucky enough to have a good jazz program in middle school and high school really developed my ears. I had fun playing in small combos with friends. I toured Japan four summers with the Monterey Jazz Festival High School All-Star Big Band, through which I connected with some amazing young players (including Ambrose Akinmusire, Jonathan Finlayson, Charles and Tom Altura, Justin Brown, Milton Fletcher, Ryan Scott, Bram Kincheloe to name a few); I learned a lot and caught a glimpse of professional music life on the road. I went to Oberlin College and Conservatory to study jazz and political science, earning bachelor’s degrees in both. There I connected with a really strong community of improvisers (including Peter Evans, Matt Nelson, Nick Lyons, Kassa Overall, Theo Croker, Nate Brenner, and our friend Rob Adkins among others) and found myself pulled towards the avant-garde and to Brooklyn, where I moved after graduation in 2005. I knew at 22 that if I ever wanted to do serious work in music that I would need to start right away, and I’m very thankful I made that choice. I spent the next six years playing as much as possible and contributing to a vibrant improvised music community in Brooklyn, including curating and hosting a regular music series in my basement for two years. During this time I also helped found and build a soul-rock-funk band called Sister Sparrow & The Dirty Birds that quickly gained a strong following and began touring nationally in 2011. Three years, 200,00 miles and over 500 shows in 45 states later I found that my underlying passions had shifted, that I was spending my down time on the road reading about politics and public policy rather than working on my own music and setting up playing opportunities. I was making music that mattered to people, and having fun doing it, but part of me wasn’t fulfilled; however meaningful my music was to the audience and to my peers it wasn’t making a significant impact on their lives and opportunities, let alone those of the millions (billions) beyond earshot. I felt called, I felt at 30 about political action as had at 22 about music, that I needed to immediately begin working in service of my values and towards a government and a society that I believe in. My dad used to whistle a lot when I was really young. I don’t remember learning it at any particular point, but when I began listening to jazz obsessively in middle through high school I got in the habit of whistling along just walking around with my Discman all day. So it just became natural to whistle bebop. I kind of had a running stream of quarter note swing going through my head in those days (still notice it at times now but it’s further in the background) and I would often start whistling lines out loud, just externalizing what I was hearing in my head. Plenty of complaints from mom and friends. Did this daily through college and while I never really whistled with other people I was whistling a lot. After moving to NYC I had some opportunities to whistle professionally, laying down a few studio tracks as a guest and busting it out every few shows with Sister Sparrow & The Dirty Birds, and have also done a few jam sessions where I’ve been just whistling. I think the best thing about it actually is being able to sit in credibly and comfortably in a jazz setting even if I don’t have my horn with me, it’s just really fun and freeing, and I’m always thankful for the opportunity to share it with people. There are a lot of similarities with the trombone in that they’re both fretless instruments and so essentially require some kind of attack (air or tongue) to delineate individual notes, which can get tricky at fast tempos. But they’re also so different it’s fun to have both. I hope to continue to develop my whistling and ultimately make some recordings that I can share. Thank you, Rob, Matt, Ryan, and Chris, for transforming a Saturday afternoon most memorably. It is possible I have clothing older than jazz trombonist Charlie Halloran, but I am thrilled to let you know about his CD, which contains some wonderful music. The first thing you might notice about the disc’s cover above — leaving aside the energetic graphic design — is that it advertises a band rather than a soloist, and that is all to the good. When you notice that Charlie has surrounded himself with people who have been making recordings longer than he has — their names follow this extended sentence — you know that he knows quality, as do they. Who are those people surrounding Mister Halloran and his slide trombone? How about Tim Laughlin, clarinet; Steve Pistorius, piano; Tom Saunders, string bass; Charlie Fardella, trumpet; Walter Harris, drums; Jimbo Mathus, vocals. I know half of this band personally, and even if I’d never heard the CD, their presence would be a living testament to their faith in Charlie and the sincerity and joyous wisdom of his music. Back to the band and to the overall idea of this disc. Since it is a band whose members embody an ensemble tradition in their work, something is always going on, even surreptitiously, throughout each of the tracks. In fact, the music is dense with surprises: backgrounds behind a soloist, interesting ensemble modifications, a rhythm section that is part Second Line, part timeless Mainstream. But everything has a fluid romping motion underneath it. And each of the front-line players is perfectly poised, a distinctive voice, immediately recognizable. I’d call the general aesthetic of this disc a modern version of hot lyricism. The Quality 6 swings throughout — no tempo too slow or too fast for dancers — but every note has a particular singing quality. And Jimbo’s voice, tough-tender, is the perfect counterpart to the instrumental glories. You’ll know that a great deal of music is marketed these days as “authentic” New Orleans. I keep away from any debates on authenticity, but will say only that the music on this disc is not loud jive for the tourists, nor is it museum-safe reverent recreation. It sounds like music, where the individuals are fully aware (in the most affectionate ways) of the tradition but know that their task on the planet is to express themselves — and that’s glorious. The songs are: In The Gloaming / Bouncing Around / St. Louis Cemetery Blues / Dreaming The Hours Away / The Ramble / Let’s Put Our Heads Together / Beautiful Dreamer / Memphis Blues / If We Never Meet Again / Weather Bird / June Night. I asked Charlie for his thoughts on the repertoire, and he told me, “Most of these tunes are songs I’ve learned in the past 4 or 5 years and just don’t have the opportunity to play very often. Although, as I’m playing with these veterans more, that is starting to change. I play Dreaming the Hours Away with Steve Pistorius pretty regularly and Tim has been calling If We Never Meet Again at the Palm Court recently. St. Louis Cemetery Blues is a Squirrel Nut Zippers song that we never played when the band was touring, so I really wanted to get that down and have Jimbo, the composer, sing it. I share his love of Stephen Foster, so I thought he would be perfect for Beautiful Dreamer, the arrangement and cadenza I ripped off a bootleg recording of Pops on the Ed Sullivan show via Ricky Riccardi. The Ramble is from those killer, Lawrence Brown heavy, recordings of the Paul Howard band. I get a kick out of how the song holds up to a New Orleans treatment. Bouncing Around I’d only ever played from the music with Orange Kellin’s band. I was trying to give it more just a raggy feel, how a band where not everybody could read might play it, half from memory, approximation. June Night I learned from Ed Polcer, Weather Bird I was thinking of those Jelly Roll trios as much as the Louis/Hines version. Enough words for the moment. Charlie’s biography, for those who like that thing, is here. Here are two links to the music — and the music. And of course, here’s Charlie’s Facebook page. Young Mister H is not someone I greet at the beginning of his brilliant career. He’s already living it, and his debut CD shows it beautifully. The only fault I could find with this issue is that it isn’t a two-disc set. And I do not write those words casually. 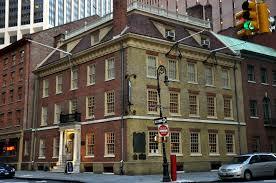 To some, Fraunces Tavern at 54 Pearl Street in lower Manhattan is most famous as the spot where George Washington held a farewell dinner for his troops in 1789. Others like it because of their wonderfully extensive beer list and straightforward food — nice servers always, too. Also, it’s a fine place to bring the family if you’re coming or going to Ellis Island or the Statue of Liberty. For me, it’s a little-known hot spot of rhythm on Saturday afternoons from 1-4. I came there a few months ago to enjoy the hot music of Emily Asher’s Garden Party Trio [plus guest] — which you can enjoy here — fine rocking music. But let us live in the moment! Here are four performances by Rob Adkins, string bass; Craig Ventresco, guitar (the legend from San Francisco and a friend for a decade); Mike Davis, cornet AND trombone. “Trombone?” you might be saying. Mike is very new to the trombone — a number of months — and he was playing an instrument not his own. So he was a little sensitive about my making these performances public (those dangerous eyebrows went up and threatened to stay there) but I assured him that his playing was admirable, even if he was severe on himself. His cornet work is a complete delight. The music Rob, Craig, and Mike make is delicate and forceful, incendiary and serene. You’ll see and hear for yourself on these four performances. Rob swings out with or without the bow, by the way. LILA, which I associate with a Frank Trumbauer / Bix Beiderbecke OKeh — a song I’ve never heard anyone play live, so thank you! There will be more to come from this Saturday’s glorious hot chamber music performance. And this coming Saturday (August 1) Rob Adkins has asked trombonist Matt Musselman and guitarist Kris Kaiser to start the good works. I know they will. My name is not all that unusual, if Google is any indication. There’s me, then a Michael Steinman who’s a doctor, an authority on world government, an attorney, a provost, the deceased frontman for the band Inch, a realtor, an actor, a college dean, an author of a book on domestic abuse, a math teacher. I gave up on the fourth page of the search because the apartment seemed crowded with ectoplasmic figures who were insisting that they were real and I wasn’t. 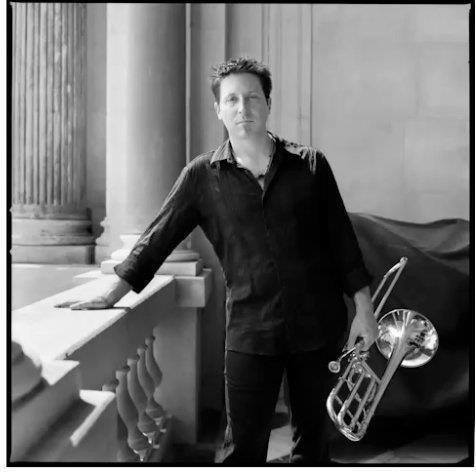 But I was greatly amused and pleased to encounter the Michael Steinman who is an appealing jazz trombonist and singer. Born in Santa Clarita, California, this MS has lived and studied in Bloomington, Indiana, and now calls Six-Fours-les-Plage, France, home. I was delighted — after the initial shock of seeing “my” name in print attached to another person — to meet this other (and talented) Michael here. 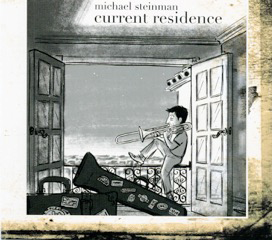 And the pleasure continues with Michael’s new CD, appropriately called CURRENT RESIDENCE. It is an appealing blend: “traditional” repertoire with a charmingly quirky twist. The songs would lead you to believe that the approach would be firmly grounded in early-jazz conventions: STRUTTIN’ WITH SOME BARBECUE / DARKTOWN STRUTTERS BALL / IS YOU IS OR IS YOU AIN’T MY BABY? / AFTER YOU’VE GONE / ON THE SUNNY SIDE OF THE STREET / BIG BUTTER AND EGG MAN / I DIDDLE / JACK, YOU’RE DEAD / JUMPIN’ WITH SYMPHONY SID / JUST A GIGOLO — but there are no straw hats, striped blazers, or sleeve garters here. An unorthodox yet swinging instrumentation also helps the music be lively rather than formulaic. What makes this CD special is a combination of a few things. First, Michael is a splendid trombonist. He doesn’t see the instrument as a way of spraying notes at a captive audience; he is a swinging melodist, a modern mainstreamer who doesn’t copy anyone. He is also a really fine — and not ordinary — singer, someone who seems like a distant cousin of Mose Allison and one of the Everly Brothers (you can pick) without ever losing a jazz feel. And the strolling players who accompany him (most often alto saxophone and a small quiet rhythm section) are on the same wavelength: thoughtful without being numb, enthusiastic without being raucous. Praise to his colleagues: Jonathan Soncasse, Willy Quiko, Lionel Pellister, Eric Merdiano, Gerard Murphy, Anne Carriere, Eric Fillou, Lorenzo Brignone, and Gabriel Charrier. I would have a listener begin at the end — a fitting tribute to quirkiness with its own reward — with a deeply tender reading of JUST A GIGOLO that begins with a smoothed down Monkish piano solo, then moves to trombone / piano, alto saxophone / piano, and finally vocal / piano — sweetly and sadly, more Crosby than Prima. It’s one of those recorded musical performances that is shapely, quiet yet deep, and completely satisfying. Here are more sound samples, and a way to make a purchase for the motivated among us. The CD is also available through the usual sources — as a download on Amazon or iTunes, and at Michael’s website, here, where the essay that accompanies the CD cover is both charming and candid. This other MS has a future: his music is lively and full of feeling, and his CD sounds as if he knows the past but is not condemned to repeat it. I recommend it highly, and would do so even if his name was not so melodious to my ears. Posted in "Thanks A Million", Bliss!, Generosities, Jazz Worth Reading, Mmmmmmmmmmmmm!, Pay Attention!, Swing You Cats!, That Was Fun!, The Heroes Among Us, The Real Thing, The Things We Love, Wow! My title doesn’t refer to someone’s hallowed solo or a famous 78 recording. No, it’s music created this month, March 2015. I have watched with pleasure and amusement the birth and development of a new band — no, a new instrumental ensemble with its own gravely whimsical music. The object of my affection is the Endangered Species Trio, which brings together Emily Asher, trombone; Tom Abbott, bass saxophone; Rob Reich, accordion. I could make a case for all species as being endangered these days, but the title refers more to the three instruments, which have been the subject of curiosity (at best), sliding down to active mockery, contempt, disdain, and incredulity. Except for the trombone, which has a certain acceptance — although there are many jokes about trombones and trombonists — the bass saxophone and the accordion are regarded, at best, as highly miscellaneous instruments, even though both of them are capable of great beauty. Tom, Emily, and Rob just returned from a brief stay at an artists’ retreat in Banff, and they shared this delicious musical vignette, TOM AND LIZ, on YouTube. I expect to have a good day — pleasing experiences have already taken place and there are more to come — but for sheer compact pleasure, these two minutes and twenty-seven seconds will be hard to top. Go ahead: see if you can listen to it only once. I dare you. More about this wonderful group here. This was recorded on February 22, 2014 at the very happy jazz weekend known as the San Diego Jazz Party, where sweet swing is the main dish on the very welcoming menu.